That's what I'm attempting to make right at this moment. I've never made chicken soup the way they make it here but I'm trying it tonight for my sick 'bebe'...yep, the husband. He stayed in bed the whole day....that's all. All I have to do is to make the little chatterbox is not making too much noise as I want the Dad to fully recover. The little one is doing a good job for the most part. A couple of times she forgot but she quickly recovered...LOL! 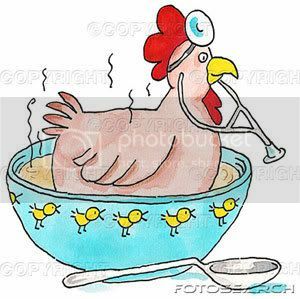 so how was your chicken soup? wish i could make one too! i'm just so hopeless in the kitchen!